New and improved FX5 Formula. FX5 Serum makes eyelashes stronger, thicker and visibly longer. * Your eyelashes have been weakened as a result of extension or chemotherapy. The Long 4 Lashes Eyelash Serum with FX5 formula - Most Effective Eyelash Serum! Unique ingredients improve the condition of eyelashes, making them look longer, thicker, smoother and full of exceptional vitality. The innovative Long 4 Lashes FX5 formula works during the entire eyelashes life cycle to ensure exceptional effectiveness. 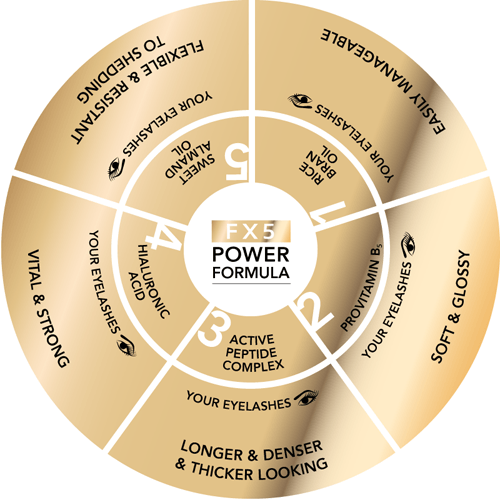 Penthasymin- providing power to the formula and containing active peptides supported by moisturising-nourishing substances, visibly improves the eyelashes appearance and gives your look an outstanding expression. Pro Vitamin B5 penetrates the hair fibre and improves the hair structure, giving it a soft and glossy appearance. Sweet almond oil conditions the eyelashes from the roots, making them more flexible and resistant to shedding. If you dream about long, thick and beautiful eyelashes- FX5 Serum is for you! The first results may be noticeable after only 4 weeks of regular use. To see the maximum effect, a full four-month treatment should be completed. To preserve the effects of a completed treatment, the serum should be applied 3-4 times a week. approximately 4-6 months of daily use. Apply the serum with one stroke of the brush-applicator on clean, dry skin of the eyelids along the upper lash line (after removing make-up). Use once a day at night. Not recommended for daytime use. Do not apply inside the eye or on the lower eyelash line. The product may be used by persons wearing contact lenses (remove your contacts before application), after completion of chemotherapy, on extended and thickened eyelashes, on permanent make-up and on henna-tinted eyelashes. Precautions! Avoid contact with the eyeball. Do not use in the case of hypersensitivity to any ingredients of the product. In case of chronic eye conditions (e.g. glaucoma), please seek medical advice before applying the product. Do not apply the product to red, irritated or broken skin. In the case of the product getting inside the eye, please rinse the eyes generously and thoroughly with warm water. After initial use, occasional skin irritations may appear. In this case, it is recommended to stop the application of the product for one day, which should stop uncomfortable symptoms. If the symptoms persist, stop using the product and consult a doctor.